Originally from California, Paul now resides in Augusta, Georgia -yet he has continued to pursue life and art in the style of his fast-paced origins. Relentlessly experimenting with new concepts and techniques, this artist remains passionate and dedicated to his art. Paul’s art spans the spectrum including mosaics, stained glass, painting (including murals), sculpture, and graphic design which clearly shows a talent for working with a variety of media and subject matter. He incorporates an impressionistic style where his glass looks like paint strokes invoking movement and direction. Paul has also pursued other dreams with the same vigor. He holds the 1989 Guinness World Record for the longest skateboard jump (over 26 barrels). In addition he is a third degree black belt and has both state and national championship belts for amateur kickboxing. 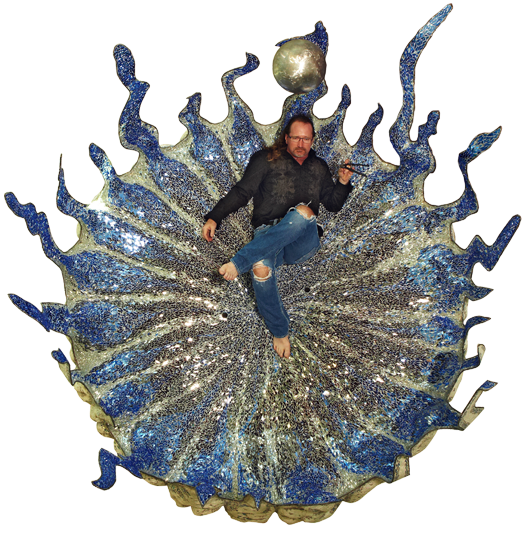 He enjoys creating one-of-a-kind works of art to help people achieve their own unique fashion and decorating visions. His work is currently displayed in boutiques, galleries and homes throughout the United States as well as being worn by some of the most discerning clients. Paul has worked in mosaic art for almost a decade and recently returned to his jewelry- making roots with “Art for Your Hips.” Each buckle reflects a step back in time when artisans took pride in their workmanship thus creating the unique retro look and feel of a family heirloom. Many days and nights are invested by this artist in designing and creating pieces that can be worn and treasured for generations to come. Paul’s creative ingenuity combines spectacular cabochons of spider web turquoise, jasper, Australian opals, tiger eye, blood coral and labradorite into micro-mosaics to be displayed not on walls but on the hips of those who know and appreciate art. Designed and created, “ Seattle Blue,” a life-size mosaic horse. Thousands of tiny pieces of glass were hand nipped and placed with metal tweezers on the large fiberglas horse. After Paul invested approximately 460 hours on the donated artwork, this piece was purchased at a United Way auction for ten-thousand dollars. The horse now resides on a balcony at the Jazz Cafe, D Timms, downtown Augusta, Georgia and is considered a landmark in the town (read the horse story). In mosaic work - passion is a must. When an artist invests 400 hours in a piece, that’s a statement in itself. Everyone can create, but not everyone has the fortitude to endure creating.